We were delighted that our own Justin Campbell completed the new Promethean accredited certified installer training course last week at Promethean’s head office in Blackburn. SCS’s Andrew Smyth said “Staff development is so important for us in helping deliver the best possible service to our customers”. Over the last few years developments in technology mean the ActivPanel is more than just a classroom periphery. It is essentially the connect hub of the classroom. 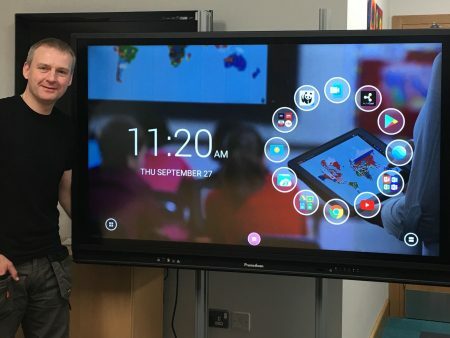 As part of Promethean and SCS’s ongoing commitment to delivering the best products and service, we were thrilled to be involved in the ActivPanel Installation training programme. This is an individually recognised certification and Justin will now be awarded ‘Promethean Installation Certified’ status.